At Expo ’67 in Montréal, Quebec, Canada, the world first saw the Alfa Romeo Montreal. 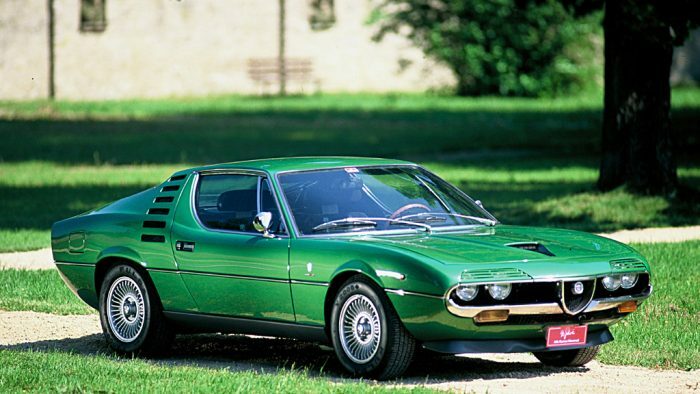 Presented as a concept car, it was stylistically different from any previous Alfa and reached full scale production 1970. Built as a 2+2 coupé, the Montreal was distinguished by its front headlight treatment by designer Marcello Gandini at Bertone. He fitted the headlights beind four unusual grilles which, by the time the car reached prodcution in 1970, were replaced by larger, single panels. Other unique details included a hood-mounted NACA duct and nonfunctional slats behind the doors. The first two prototypes were powered by an inline-4 from the Alfa Romeo Giulia, but the production version was much more serious. Instead it was powered by 90° V8, with competition features like dry-sump lubrication and SPICA fuel injection. This was a derivative of the same potent V8 which was used in the Alfa Romeo 33 racecar. Chassis details were lent from the Giulia GTV including its double wishbone front suspension with a live axle in the rear. Almost 4000 Montreals were produced from 1970 to 1977. Ironically, none were ever sold in Montreal because Alfa Romeo was limited to European markets. 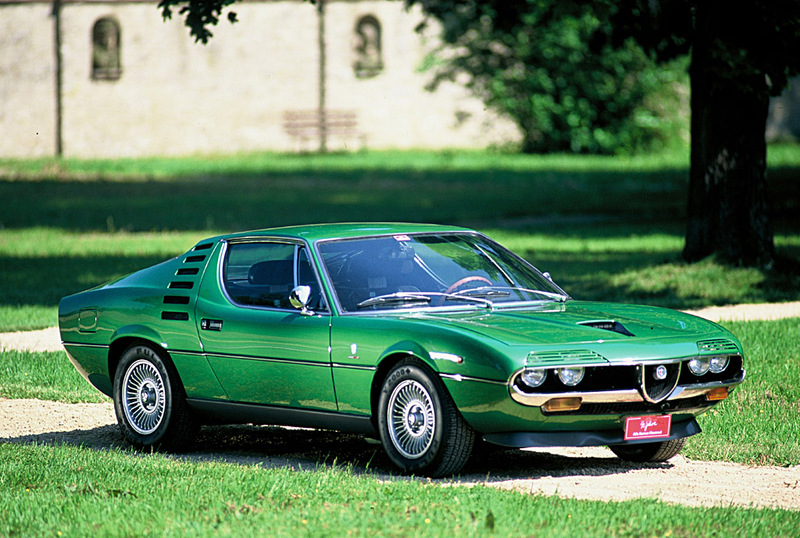 1972 Alfa Romeo Montreal 1426423 – sold for $96,250 Owned by Luigino Neri of Terni, Italy for 42 years. Repainted and sold in 2013. Remained in Italy until imported to USA in 2015. Beautifully presented example of classic Bertone styling. Striking original color combination. 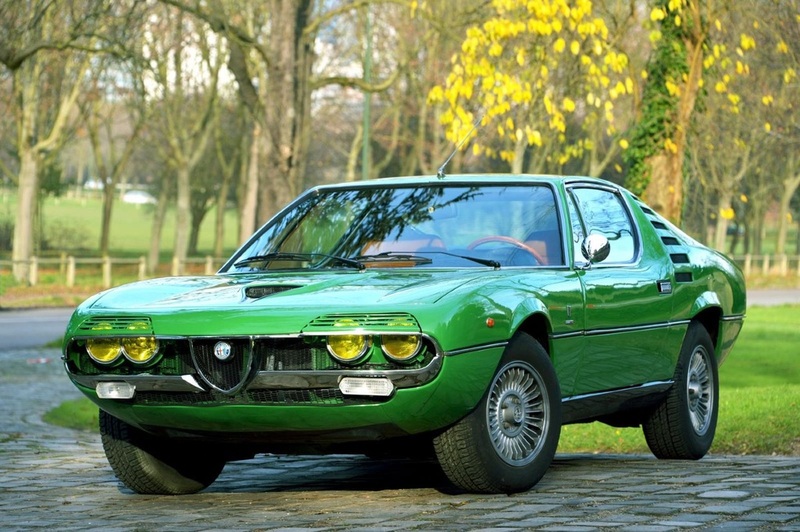 1973 Alfa Romeo Montreal AR 1426330 – sold for $110,000 One of approximately 100 examples in the United States. Powerful Tipo 33-based V-8 engine. Iconic design by Marcelo Gandini. Superb restoration by a longtime Pebble Beach judge. Rare factory-equipped air conditioning. Offered with manuals and an original tool pouch. In 1986, the car was stored in a barn belonging to the family in Savoie, when Paul Gavarini and his family moved to California. On 8 November 1991, during a visit to France, he had a valuation carried out on the car, which at that time had covered 44 698 km. In 2013, Jean-Hugues Gavarini retrieved the car, and decided to have it completely restored by a German friend who had a paint workshop. The Montreal was stripped back to bare metal and no expense was spared in the work carried out. A file of photographs and bills will be supplied with the car. Mechanically, it was thoroughly overhauled by Quadrifoglio, which notably included replacing the cylinder head gaskets in 2014. In superb condition today, this Alfa Montreal retains its original leather, now beautifully patinated, and has new carpets. The odometer records 45 650 km, which the family believes to be original, given its lack of use. 1970 Alfa Romeo Montreal AR0012101353 – sold for $99,000 This particular example, finished in its original paint color of Argento Silver Metallic with a red leather interior, was believed to have been delivered new to France. Rarely seen in the U.S. Single owner from 1985 to 2012. Recent thorough refurbishment and cosmetic restoration. Elegant color scheme. Unique Marcello Gandini styling. 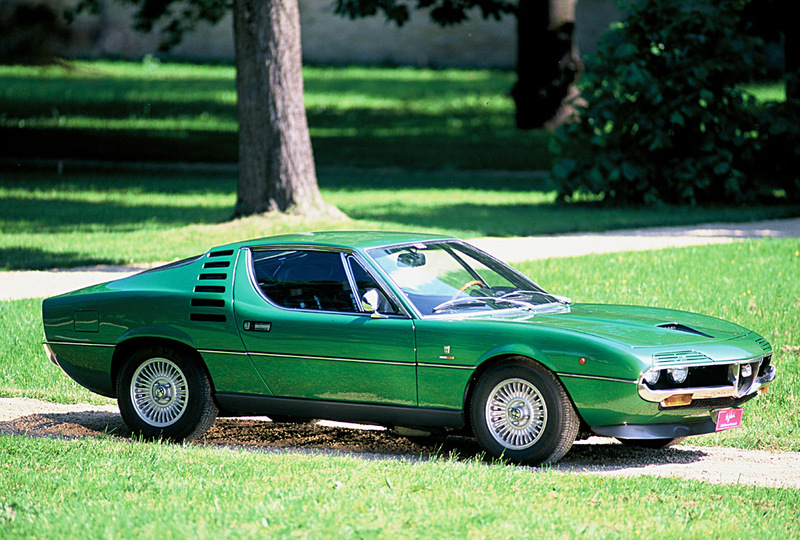 1973 Alfa Romeo Montreal AR1426330 – sold for $99,000 Restored by a Pebble Beach Judge in 2013. Longtime California Car. 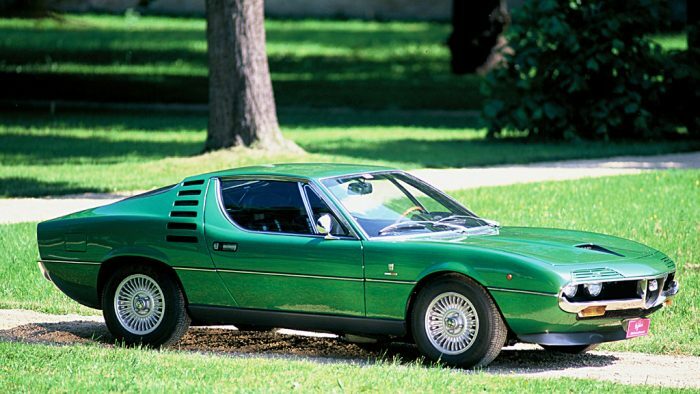 Innovative Marcello Gandini Styling. One of Approximately 100 Examples in the US. Rare Factory Air-Conditioning. 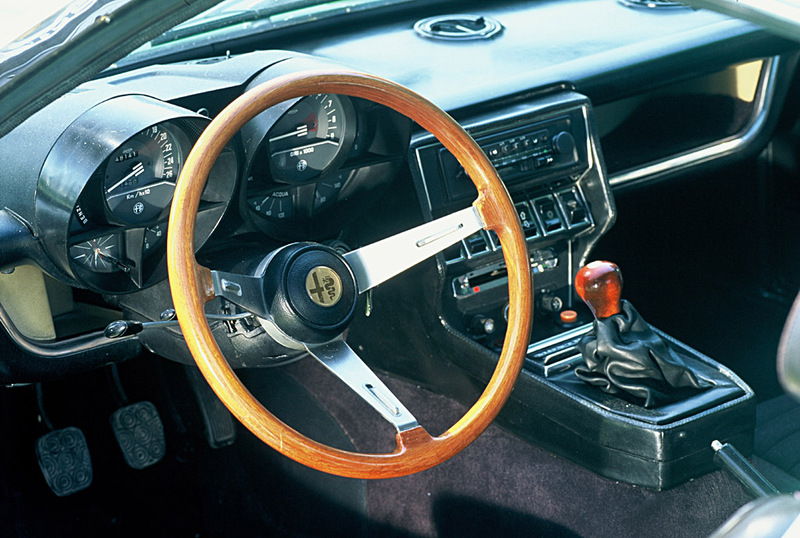 The Alfa Romeo Montreal prototype was introduced the world at Expo 67 on Isle Notre Dame in Montreal, Quebec, the center of Canada’s year-long celebration of its centenary. Based on the highly successful 105-series Giulia and designed by Bertone, the production version shared the prototype’s fastback profile, roof side cooling slots and hooded headlights, but enthusiasts contend that its best feature is the 2.6 L 4-cam V-8 under the hood, essentially a detuned version of the engine used in the racing Type 33. A 5-speed manual gearbox, power steering and ventilated power disc brakes help make this pristine 1971 Montreal, which shows a believed-actual 18,760 kilometers, a formidable performer. 1977 Alfa Romeo Montreal Coupé – sold for €32,200 Sold new in Holland, this example has had approximately five owners from new and comes with service history. The car has been partially restored while retaining its original dark metallic brown livery, and comes with sundry invoices for recent work by Vireo (on the engine) and previously by Sam van Lingen. Offered with Netherlands registration papers. 1972 Alfa Romeo Montreal – sold for €29,900 Finished in its attractive original colour scheme of white with blue interior, this particular Montreal benefits from a recent major service and has been fitted with a new exhaust system, battery and tyres. The car is currently registered in the Netherlands and comes with FIA papers.